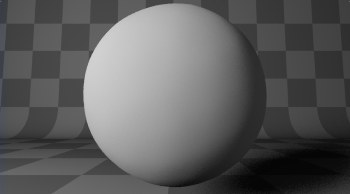 What does the Roughness setting value in a Diffuse shader actually do? Surface roughness; 0.0 gives standard Lambertian reflection, higher values activate the Oren-Nayar BSDF. But what does this mean in terms of how rays are affected? The results are different, but what are the technical differences of how these shaders are calculated? Lambert discovered in 1760 "Lambert's cosine law", which says that the intensity of the diffusely reflecting light is proportional to the cosine of the angle between the direction of the incident light and the surface normal. This, however, is inaccurate for several real-world objects with rough surfaces (for complicated reasons: masking, shadowing and interreflections). For example if the moon reflected the light in a Lambertian way, the moon's surface would be darker around the edges. 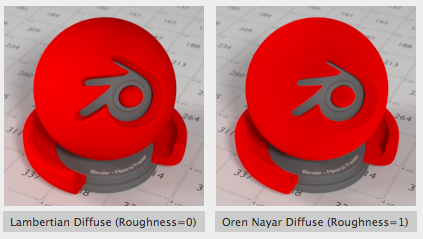 Oren and Nayar created in 1993 the "Oren–Nayar reflectance model", which takes roughness into acount. The math is pretty complicated (you can check out the details at wikipedia...), but the important part is that there is a "roughness" parameter in the 0 - 1 range (which can be adjusted in the Blender node), and when the roughness is zero, then the Oren–Nayar reflectance becomes mathematically equivalent to the Lambertian reflectance. 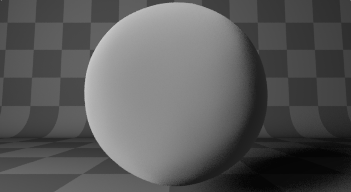 It is completely normal that a diffuse sphere with roughness = 1 appears "shadeless" if it is illuminated with a light that is behind the camera - this is exactly what the moon looks like. For an in-depth explanation see this video (especially minutes 35-37): SIGGRAPH University - Introduction to "Physically Based Shading in Theory and Practice"
The diffuse shader scatters the light in all directions. But most of the light is scattered along the surface normal. A high roughness value spreads the light more evenly in all directions. What the right value is depends on the material you want to simulate. Better: If you have a roughness of 0, the amount of light a surface reflects depends mostly on how much the surface is facing the light source. As you can see, the mesh with more roughness shows more shadow around the edges. This is because rough surfaces reflect less light and show more shading than smooth surfaces. Not the answer you're looking for? Browse other questions tagged rendering cycles light shaders or ask your own question. What does the radius vector do on an SSS shader?